An award-winning gamer in Australia. Wandering around with two purposes. Buy four, get one free. Do these differences make a difference? Which are more effective: training games or lectures? This frequent question is also a very frustrating one. This question is very much like Which are better: apples or oranges? The answer obviously depends on a number of factors. What purpose are we talking about? Oranges are better for making breakfast juice but not very good for making pies. The comparison between training games and lectures (or videos, or textbooks, or CBT, or workshops, or whatever) is as meaningless as comparing apples and oranges. When we say games, what exactly do we mean? Obviously, there is an enormous difference between a simulation game that authentically reflects workplace processes and an icebreaker that requires participants to match the lines of a limerick. Similarly, what do we mean by the term lecture? Are we referring to a boring monologue by someone who does not know the subject or an inspiring presentation by an expert who continuously responds to questions from the audience and provides authentic examples? How about a lecturer who presents short scenarios, and requires the listeners to pair up with each other and come up with recommendations? Do we classify this hybrid technique as a training game or a lecture? A decade ago, Richard E. Clark at the University of Southern California did a meta-analysis of controlled research studies that compared different training media such as an educational film and classroom instruction. Not surprisingly, Clark came up with the conclusion that the choice of media doesn't make any difference. What makes the difference is the design. For example, we can use a discovery-learning design approach in an educational film or a classroom lesson. The critical factor is not the medium but some specific feature of the medium. If we extrapolate Clark's findings to our initial question, we will conclude that it is not games but specific features of games (such as active participation, score points, interaction among team members, and competition across teams) that make a difference. It is not lectures in general, but the critical features (such as the accuracy of content and the credibility of the lecturer) that make a difference. Whether a game is more effective than a lecture also depends on the purpose to which it is being used. A simulation game is effective when used for helping participants acquire certain analytical skills. However, it would be ineffective for helping participants get acquainted with each other at the beginning of a training session. An icebreaker with the lines of a limerick effectively serves the purpose of getting acquainted but it will be perceived as being silly when used in the middle of a workshop on cost-benefit analysis. Whether we compare a training game with a lecture, or one training game with another, or one lecture with another, it is important to specify the purpose for which the training technique is being used. Different people react differently to the same training game. For example, a game that highly motivates a typical US group may be perceived as fluff and irrelevant by a typical Canadian group and downright threatening by a typical Japanese group. Similarly, a lecture that excites a group of young adults can confuse a group of older adults. The opposite could also be true: a videotaped lecture that appeals to baby boomers may bore members of the Nintendo generation. Which of these two techniques is more effective in helping a group of experienced hotel employees acquire customer-service skills: an authentic simulation game that incorporates critical incidents and includes a lengthy debriefing by an expert facilitator or a lecture with workplace anecdotes followed by a group discussion? This requires three participants to exchange a piece of practical advice on a card they received. In the process, each participant has to recall the piece of advice, explain it in his or her own words, and present an application of this advice to a real-life situation. The participants also receive useful feedback from each other. Each card in a deck of 52 Practical Advice Cards contains an actionable guideline related to a specific topic. We currently have 10 different ready-to-use decks of cards for sale in our online store on the topics of trust building, coaching, interviewing, customer service, feedback, listening, managing globally, leadership, motivation, and presentation skills. This game, Recall and Apply , does not require a complete deck of 52 Practical Advice Cards. You can prepare your own cards by writing brief practical suggestions on blank cards. You can get started with half-a-dozen pieces of practical advice. Each participant reads the piece of advice from a card. The first participant gives his or her card to the second participant and explains the advice to the third participant. Later, the first participant gives an example of how the advice can be applied to a real life situation. After this interaction, the second participant rates the first participant's accuracy of recall and the third participant rates the realism of application. To recall, explain, and apply a piece of practical advice. Organize triads. Divide the participants into playgroups of three members each. Give a practical advice card to each participant. Specify the tasks. Ask the participants to carefully read the piece of advice printed on his or her card. Tell them that they have to get ready for two tasks: explain the piece of advice in their own words and come up with an application of the advice to a workplace situation. Announce an appropriate time limit. Conduct the first round. Ask each triad to select one participant to go first. Ask this person to give his or her practical advice card to the person on the right and explain the piece of advice to the person on the left. While this is happening, ask the person who now has the card to compare the explanation with the advice printed on the card. After this is done, ask the person to share the application. Give feedback. Ask the participant with the card to comment on how well the first player recalled the information printed on the card. Then ask the other person to comment on how realistic the application sounded. Encourage these participants to provide both positive and constructive feedback. Repeat the procedure. Ask the other two participants to take turns to recall and explain the advice on the card and to provide an application. Encourage the listeners to provide positive and constructive feedback. You have a few leftover players? If the total number of players is not evenly divisible by 3, you may have one or two extra players. If you have one extra, ask him or her to observe the play at a triad. If you have two extras, join them to create another triad. Want the activity to feel more like a game? At the end of each round, ask the two listeners to give 1 to 5 points to the participant who did the explanation and application. You have ample time? Give the participants new cards and have them read, recall, explain, and apply the additional pieces of advice. Would you like several other games to play with Practical Advice cards? Download a manual with 12 different games from our website at http://thiagi.net/PAC/ . This activity may cost you $40, but the learning point it delivers is priceless. It helps your participants to explore the concept of volunteer's dilemma and the bystander effect. Five participants individually indicate whether they want to receive 10 dollars or 10 cents. Each participant receives his or her choice—provided at least one of them chooses 10 cents. To explore the concept of selflessness. Distribute blank pieces of paper. Give five of these pieces of paper to randomly selected participants. Make sure that these selected participants are located in different parts of the room. Brief the participants. Ask the selected participants (who received the pieces of paper) to independently and secretly decide whether they would like to receive 10 dollars or 10 cents. These five participants should not talk to each other. However, the other participants (who did not receive the pieces of paper) may talk to the selected participants and give them appropriate advice. Explain the payoff. Announce that the five participants will receive the amount of their choice (10 dollars or 10 cents)—provided at least one of them opts for 10 cents. Remind everyone that the participants should not talk to each other during the decision-making period. Conduct the activity. Announce a 2-minute time limit for the five participants to make their decision and secretly write the amount of money they would like to receive. Also ask them to write their name below the selected amount. Once done, ask these participants to fold the piece of paper so that their choice will be hidden. Explain the concept of volunteer's dilemma. Present the dilemma faced by the five selected participants: One of them has to make a sacrifice so all the others can benefit. At the same time, if more than one person selected to receive 10 cents, this will be a wasted sacrifice. This dilemma is labeled “volunteer's dilemma”. It is also called the “bystander effect” when several people witness a crime but nobody calls the police under the assumption somebody else would have done it. Ask for examples. Ask the participants for examples of the volunteer effect in the workplace. Discuss the negative consequences of “let-someone-else-do-it” attitude. In some situations, a simple sacrifice on the part of one person may benefit several others. If everyone waits for someone else to perform a critical task, nobody will benefit. Read the brief article in the Wikipedia about volunteer's dilemma: http://en.wikipedia.org/wiki/Volunteer%27s_dilemma . Follow the links for additional information. Note: The Dallas workshop has been rescheduled to accommodate some of our friends and partners who couldn't otherwise attend. Thiagi and Matt are happy to announce that they will be facilitating two 3-day Interactive Techniques for Instructor-Led Training workshops. The first one will be in Albany, New York, in association with Hudson Mohawk Chapter ASTD. The second one will be in Dallas, Texas. HOW MUCH? Regular registration rate: $1600. As a reader of Thiagi GameLetter , get $200 off by entering coupon code TGL-WS13 when you register online. MORE DETAILS? See the brochure at http://thiagi.net/workshops/albany2013brochure.pdf (313k PDF). MORE DETAILS? See the brochure at http://thiagi.net/workshops/dallas2013brochure.pdf (1.2m PDF). Learn how to encourage your participants to interact with each other, with the training content, and with you, the facilitator. In the design part of today's session you explore 60 different interactive strategies. You learn to rapidly create five of these powerful strategies. In the facilitation part of the session, you learn how to conduct these interactive exercises without losing control, wasting time, and being attacked by the participants. If you agree that games can produce effective and engaging training, but if you are daunted by the delusion that it requires a lot of skill and time to design training games, wait until you experience Thiagi's framegame approach. Using this approach, you can design effective training games in a matter of minutes. In today's session, you will learn to design and facilitate board games, card games, instructional puzzles, improv games, and magic activities. You will also learn to ensure that these activities are directly related to your training objectives and business results. Can you provide real-world learning opportunities without incurring the risks and costs associated with them? Yes, you can—by using simulations. Because simulation games are very similar to on-the-job training, they ensure effective transfer and application of what you learn in the workshop to the workplace. Different types of effective simulated activities focus on selected aspects of the workplace reality. In today's session, you will learn how to design, deliver, and debrief these types of simulation activities: brief simulations called jolts, the case method, interactive storytelling, roleplaying, and debriefing games. Because you are a reader of TGL, you may register at the discounted rate of $1400 ($200 off the regular rate). Enter the coupon code TGL-WS13 when you register. To register, visit our online store at http://www.thiagi.biz/category_s/1828.htm or phone Brenda at 812-332-1478 . Fifteen years after my first meeting, I met Alastair again during my recent visit to Australia. Dr. Alastair Rylatt is one of Australia's leading facilitators. Over the last 30 years, Alastair has built a reputation as someone who surprises individuals and groups with great content and processes including a range of experiential activities and games. His work has taken him to many corners of the world including the Asia-Pacific, Europe, USA, and Middle East. He is the author of a number of books including the award-winning Creating Training Miracles (coauthored with Kevin Lohan). In late 2012, Alastair completed his Ph. D. at the University of Technology, Sydney. His client list includes over 400 businesses, nonprofits, and government organizations. You can visit Alastair at his website ( http://www.alastairrylatt.com/ ) and connect with him on Linkedin ( http://www.linkedin.com/in/alastairrylatt ). TGL: Alastair, what is your specialty area? Alastair: In the last decade, my major focus has been in leadership development, change management, building better teams, strategic thinking, and executive coaching. Alastair: After leaving high school, I developed a love for the theater and in the following years did many short courses in mime, narrative therapy, theatresports, improvisation, and comedy. In venturing into these worlds, I learnt that many of the techniques and skills were highly relevant to a facilitator. To be outstanding, you need to experiment and play with ideas and processes. I have always had a love for designing and using activities for learning. I may not use the word game so to speak but my list of choices of experiential exercises are in the hundreds. My inspirations and ideas come from the arts, training and development, psychology, psychodrama, and business education. As a training and development professional in the 1980s, it became apparent that just delivering training content was not sufficient. I needed to integrate engaging and meaningful activities into my facilitation. This discovery has stayed with me to the current day. Alastair: I started using “games” in the 1980s in many management, leadership, and career development programs. I am a firm believer that learning is embodied: You need to get people to use all their senses to make progress. Everyone has a story to tell and I encourage them to share how they have formed a view of themselves and how they make sense of their world. I use minimal Powerpoint slides and tend to work with what arises in the room. A circle of chairs in the room gives me the maximum flexibility to change the conversations and connections in a moment's notice. Alastair: During my facilitation you would see me using a range of activities, both indoors and outdoors. My work takes me to both business organizations as a consultant and to academia where I work as an adjunct lecturer. Alastair: Their feelings can range from joy, surprise, embarrassment, anger, sadness, or ambivalence. What is more important is that I create an experience that places people in the learning zone. I am not attached to whether people like me. I want people to discover new insights about themselves and others. What is important is that people feel safe within the exercise and there is a clear learning objective. Alastair: One night I was conducting an evening activity in a golf course. To my horror, two of my participants fell into a bunker. Luckily, they found it amusing, dusted off the sand, and continued the exercise. Ever since that time, I carefully check out the terrain well in advance in daylight. Alastair: Games should not be treated lightly. Be always aware of your purpose and reason for conducting a game. The goal is not about entertainment but is about purposeful learning. Briefing, conducting the game, and debriefing must be enacted in sequence and with integrity. My major frustration is the lack of debriefing by trainers and facilitators. They either miss great opportunities to extract meaningful learning or they are more interested in moving onto the next activity. Here’s another piece of advice: Adequate warm up is also essential. Moving from low stretch activities to higher over time is a good plan. As trust builds you can expand your choices and options. Alastair: I have a great love for story and physical movement, so many of my games have that flavor. I have around 20 games that I use frequently. I have a simple Word file that contains many games from many sources and inspirations. They are arranged under various topics like leadership, emotional intelligence, and teamwork. If I get stuck on what to do, I refer to the file and pull something out and use it. Many of these games need little or no props. I am a great lover of appreciative inquiry and helping people to build on and develop their strengths. Alastair: Elyssebeth Leigh, Kevin Lohan, Glenn Capelli, and Thiagi. Pierse, L. 1993, Theatresports downunder , Improcorp Australia, Sydney. Rohnke, K. 1994, The bottomless bag again , Kendall/Hunt, Dubuque. Rohnke, K. 1984, Silver bullets , Kendall/Hunt, Dubuque. TGL: Which of your books would you recommend? Alastair: Creating Training Miracles , which I coauthored with Kevin Lohan. Rylatt, A. & Lohan, K. 1997, Creating training miracles , Pfeiffer (Jossey-Bass), San Francisco. Click the image below to browse this book on Amazon. Disclosure: We get a small commission if you order this book (or the book below) through Amazon. There will always be a place for face-to-face facilitation. There is nothing more special than human beings learning and engaging with each other. It is there where the magic happens. Near and Far is a wonderful warm up game that provides excellent avenues to build connections and to discuss issues pertaining to corporate culture, organizational dynamics, and the building of networks. I have used it in conferences and it is suitable for small, medium, and large groups. I discovered Near and Far while I was learning the craft of theatersports. Invite people to stand in a large circle where they can make eye contact with each other. If the group is too large you can break the circle into smaller clusters. I frequently conduct this activity outdoors since we need plenty of open space. Ask the participants to look around their circle and make eye contact with other people and smile. Then ask each participant to select a near person to stay close to. Keep the identity of this near person a secret. To demonstrate, randomly select a person and announce your choice. Invite the selected person to wander around in the middle of the circle and follow him or her trying to get close. Thank the selected person with a round of applause. Continue your instructions by asking each participant to select a far person to stay away from. Again in doing so, ask participants to keep their choices secret. Continue the demonstration by choosing someone else in the circle and announce your choice. Invite this person to wander around in the middle of the circle and keep a good distance away from him or her. Thank the selected person with a round of applause. Check in with the group and make sure everyone has two choices. Ask people to raise their hands to signify they have chosen one person to stand close to (near) and another person to stay away from (far). Explain safety requirements to ensure nobody gets hurt: no running, hugging, or touching is allowed. Instruct everyone to take a few steps forward to form a tight huddle. At the count of three, ask the participants to wander around, implementing both the near and far rules at the same time without talking. As soon as the group moves into action, weird and interesting dynamics will unfold. Let the system dynamics run its course for 30 to 45 seconds. This is sufficient time for patterns to emerge and not too long that it becomes boring. Invite people back into a large circle and discuss what happened and what relevance the event has to the real world. Themes for discussion may include factions, team dynamics, and assumptions about others. Here are our workshops scheduled for the next 12 months. Check our online calendar at http://thiagi.com/calendar/ for details. Melbourne, Australia: March 6-8, 2013. Interactive Training Strategies . Sydney, Australia: March 12-14, 2013. Interactive Training Strategies . Brisbane, Australia: March 19-21, 2013. Interactive Training Strategies . Amsterdam, The Netherlands: May 31, 2013. Training with Engagement, Joy, and Humor . Albany, NY, USA: June 18-20. Interactive Techniques for Instructor-Led Training . Dallas, Texas, USA: October 1-3, 2013. Interactive Techniques for Instructor-Led Training . What's your initial response to setbacks and adversity? Do you dig in, circle the wagons, seize up? Or do you go with the flow, bend with the breeze, stay flexible? If you are quickly back on your feet after a knockdown you are resilient. Learn about six types of resiliency plus how to refine and teach them to others in this issue of the Firefly News Flash. Power Tip: Avoid rescuing others to improve their resiliency—and your own. Read more in the March 2013 issue of Firefly News Flash : http://www.thefirefly.org/Firefly/html/News%20Flash/2013/March%202013.htm . 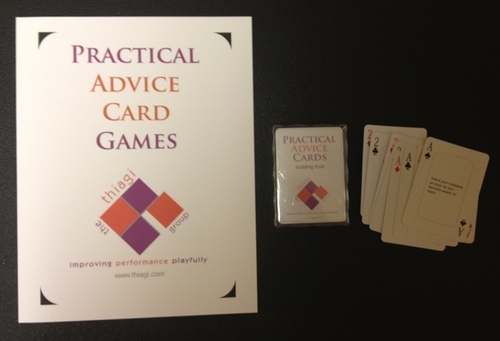 The most popular items in our online store are the Practical Advice Card Game s.
We have decks of cards on 10 different training topics. You can play 12 different games with each deck. The decks contain 52 cards, each with a piece of practical advice. This offer is valid only during the month of April. Order by April 30, 2013. To take advantage of this discount, visit our online store. Order five or more Practical Advice Card Game s and type TGL-PAC5 in the coupon code box when you check out. We will give you a $39.95 discount on your order. Building Trust . How to rapidly increase and improve your trustworthiness and maintain it over a long period of time. Sample piece of advice: Admit your mistakes as soon as you become aware of them. Coaching for Performance . How to improve the performance of your employees and team members. Sample piece of advice: Take notes, either during or immediately after the coaching session. Conducting Job Interviews . How to discover the best candidate for a job through effective, objective, and behavioral interviewing. Sample piece of advice: Encourage the candidate to use the problem-action-results structure to frame the responses. If necessary, summarize his or her first response using this structure. Feedback Techniques . How to give—and receive—effective feedback and how to benefit from the feedback given to you. Sample piece of advice: Give feedback, not advice. If the other person asks for advice, start a collaborative problem-solving conversation. Leadership Skills . How to improve the process of inspiring your followers to achieve common goals. Sample piece of advice: Ask—and answer—these questions about yourself: What are your core values? Beliefs? Visions? Goals? Strengths? Motives? Know yourself before you lead others. Listening Skills . How to listen effectively, empathetically, and critically. Sample piece of advice: Avoid multitasking. Don't check your email, send text messages, read a book, surf the Internet, or watch the TV. Close the book and turn off all electronic devices. Managing Globally . How to work with people from different countries and cultures. Sample piece of advice: Be brief. Talking too much in a frantic attempt to make the other person understand you usually backfires and creates more confusion. Motivation Techniques . How to achieve desired results by inspiring your employees. Sample piece of advice: Discover what the employee thinks is the purpose of his or her job. Do this through an open-minded conversation with the employee. Presentation Skills . How to make effective and inspiring presentations to instruct and influence your audience members. Sample piece of advice: Be playful. Incorporate games and activities in your presentation. Read about the use of cryptograms embedded into simulation games in our February 2010 issue of TGL . V QAKX PH VJ OJRVRPJR VWXPCPXI XZVX PH WAJLBWXOL PJ V FDPOG MODPAL AG XPEO XA PKKBHXDVXO AJO AD EADO PEMADXVJX KOVDJPJR MAPJXH. QAKXH DOUBPDO LOFDPOGPJR LPHWBHHPAJH XA OJHBDO EVSPEBE KOVDJPJR. Some people are visual learners and others are auditory learners. The way different people learn is influenced by their MBTI ?!!??!? personality types. For a long time, differences in learning styles were touted as important factors in designing and conducting training. Recently, however, many knowledgeable people claim that time spent in identifying and accommodating learning styles is a waste. According to these experts, differences in learning styles should not make a difference in training design. Do you think that differences in learning styles are important in designing training? How do you handle differences in learning styles in your training sessions? The message begins with “A JOLT IS…”. An overwhelming majority of you (98 percent) selected the second option: using feedback given by the others. How can you increase the effectiveness of the feedback that you give and get? 14) Try to be as specific as possible…and “catch people doing things right”! 13) When receiving feedback: Always say simply, “Thank you for the feedback” whether or not you agree. Mull the feedback over. Does the feedback say more about the person delivering it? Does it smell of judgment and fear? Or is it simply another perspective to add to and help expand your own perspective? Does the feedback require any further action? 12) Make it safe. Make sure you care about the person. A JOLT IS AN ENGAGING ACTIVITY THAT IS CONDUCTED IN A BRIEF PERIOD OF TIME TO ILLUSTRATE ONE OR MORE IMPORTANT LEARNING POINTS. JOLTS REQUIRE DEBRIEFING DISCUSSIONS TO ENSURE MAXIMUM LEARNING.